If you attend a partner high school and plan to only take CCP courses at your high school, you will register for those courses with your School Counselor and do not need to attend a New Student Orientation. Any CCP student, taking courses for the first time at a NCSC campus or online, must first meet with a NCSC Advisor to discuss your goals and build your course plan. After that you must attend orientation at the college. During orientation, we will cover vital new student information and complete your course registration. 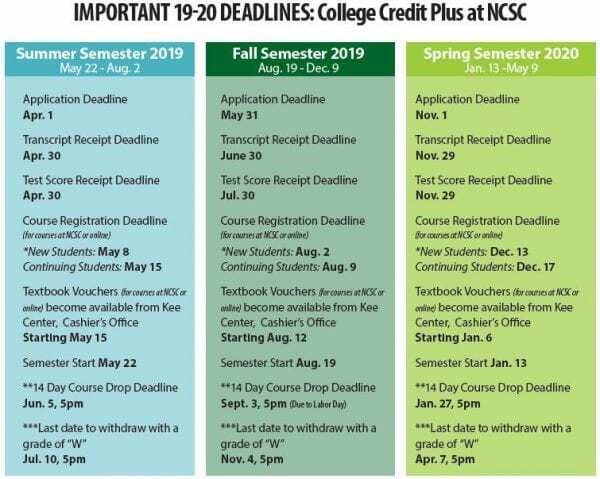 Continuing CCP students, once you’ve taken a course on the NCSC campus or online, you may self-register online, with advisor approval, during your priority​ registration period listed on the NCSC Academic Calendar. Students who do not attend one of the above-listed orientations will NOT be able to register for courses. Please give at least 1 business days’ notice for the orientation you’re planning on attending. Because seating is limited, you must schedule to attend an orientation.